There are 18 reviews of 1826 Eugénie de Montijo. A soft absinthe-y anise note dominates this slightly musty fragrance. As others have noted, there's an interesting "old books" vibe. There's also something in here vaguely reminiscent of Play-Doh. Nothing about it is unpleasant and it's decidedly unisex, but it's an acquired taste, to be sure. I would have guessed the notes for this included iris and leather, which they do not. Searching my memory and re-reading previous sampling notes, I think this effect is from the bergamot, white flowers (typically jasmine), and patchouli combination. It's a combination I like. I think this would fit right in with my collection. It smells plenty masculine, despite the marketing. It has some vintage quality to the smell, which I think is still possible with good floral concentrates. You're in the heart of the Canadian wilderness in 1756, digging with your bare hands for snakeroot (ginger). It's August, and instead of marching with your brothers on Fort Oswego to push back the British, you're frantically trying to save your best friend who was just bitten by a snake. You enlist the help of an Iroquois ally, and before long, you're all indoors and participating in a wild healing ritual dominated by potent ginger oils, powdered herbs, and sweet smoke. 1826 by Histoires de Parfums. 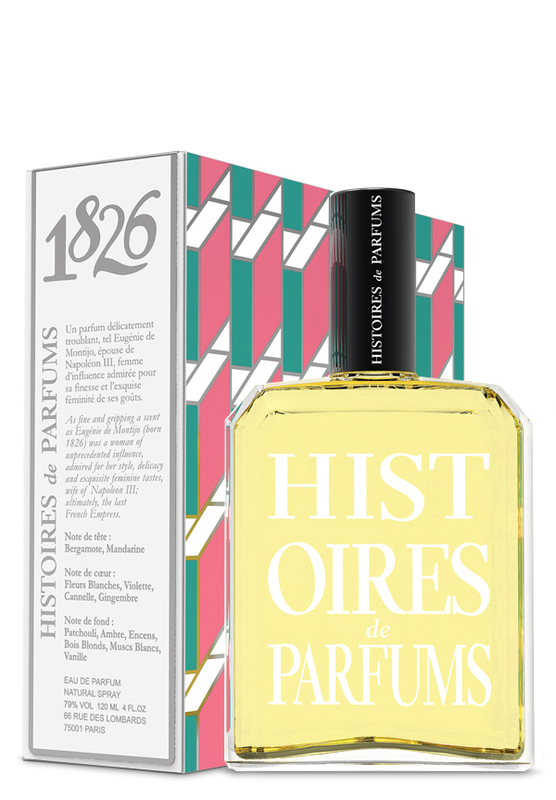 1826 by Histoires de Parfums is a dignified patchouli fragrance that doesn’t strike me as particularly feminine or masculine. There is a touch of powdery iris that keeps the whole thing from smelling like patchouli oil. The overall effect is earthy-clean. This is a far cry from all of the candy-patchouli clones out there and a nice option for someone into patch but looking for something different. One thing that I really enjoy about HdP fragrances is the old books/furniture accord that seems to be infused in some of the compositions. Maybe this is just my take on it, but for those who enjoy that sort of smell, I highly recommend checking out HdP. This was an oddball for me - seeing the wide range of descriptions in the reviews makes me think that this is a fragrance that smells very differently on different people. It opened with a strong, amber-y, spicy blast that I rather liked, but it quickly shifted to an unpleasant note that was somehow both soapy and musty. I got a little bit of the violet and cinnamon as well, but mainly that soapy smell. About an hour in, though, I started to get some nice little whiffs of a pretty white floral; however, when I brought my wrist to my nose I still got that unpleasant note. It's nice to think that it smelled better from a bit of a distance, but not much fun for me! Not very long-lasting - I'm five hours in and left with only a tiny vanilla-ish ghost . . .
Quite good anisic white floral which initially reminded be of l'Heure Bleue with more wood, but rather quickly petered out. It has a ghostly thin veil of a body with a finely honed spicy hem but the entrancing effect I get from the opening and the ensuing minutes is quickly lost and the rest of the journey is less memorable. Very pleasant but meek as a kitten. There are no member images of 1826 Eugénie de Montijo yet. Why not be the first?